Diogo operates a general store in Manututo, Timor-Leste. He is borrowing $1,000 to buy more stock for his store. We loaned $75. Bafel lives in Qana, Lebanon. He is a Syrian refugee and has run his own mosaic art shop since 2014. He is borrowing $1,000 to purchase more art to sell. We loaned $100. Maria Elena lives in Tela, Atlantida, Honduras. She sells stainless steel jewelry as a traveling merchant and also takes orders. She has been in business for three years and is borrowing $425 to purchase more jewelry to sell. We loaned $100. Sally lives in Tuaefu, Samoa. She creates and sells elei printed material. She is borrowing $500 to purchase material, fabric paint, stencils, brushes, rollers, wooden carved designs, etc., in order to produce her materials. We loaned Sally $100. Pedro Claver is a fruit farmer in Arequipa, Peru. He is borrowing $1,525 to plant more avocado plants in order to increase his production. We loaned $100. Ghenadie is 38 years old and lives in Vulpesti village in the Ungheni region of Moldova. Five years ago he decided to start his own carpentry business. His first project was a simple door which was so well done that it made him famous in his village. He does beautiful work but his woodworking machine has failed, so he can no longer work. He is borrowing $875 to purchase an engine for his machine so that he can fill orders and get back to work. We loaned $100. Kokou lives in Kegue, Togo and is a boiler maker. He makes the boilers from aluminum and other scrap materials. He is borrowing $625 in order to buy more scrap. Kokou has had loans in the past and has paid them all timely. We loaned him $50. The Grupo Patzulin Los Hermanos is three persons - Isabela, Manuela and Miguel - from Suchitepequez, Guatemala. They are borrowing $475. Isabela buys and sells tomatoes and will use her portion of the loan to purchase more tomatoes to sell. We loaned the group $100. Abdul is from Port Loko, Sierra Leone. He runs a Vitafoam business and sells different models of mattresses from a store in his community. He is borrowing $575 to purchase more mattresses to increase his business. We loaned $50. Fatma lives in Turkey and makes and sells tulle curtains. She has had several loans in the past and has always paid them off. She is borrowing $450 with which to purchase tulle fabric in bulk. We loaned $50. Any time you shop at Schnucks, you can apply the calculated "Schnucks Rewards" from your purchase toward the Open Door Food Pantry's (ODFP) weekly food costs! It is simple to do. At checkout, you are asked (by the checker or by the automated system in self check-out) if you are a member of the Schnucks Rewards program. At that point, enter the church's main number (314-863-8055) on the keypad. These rewards will be available for our volunteer shoppers IF you tell the checker you do NOT want to use the rewards at the time of your purchase. Rewards earned are approximately 2% of your bill before tax. Our pantry’s volunteer shoppers then enter the church's number and apply all rewards to the pantry’s bill! This is a painless and easy way for individuals to donate anywhere from a few cents to a few dollars to the pantry each week. Restocking the pantry costs ~$300 to $500 every week, so every penny counts! The Open Door Food Pantry Committee and our hungry neighbors appreciate all you do to support this mission. The American Medical Association (AMA) Foundation and its Board of Directors recently selected HPES as an award recipient for their 2018-2019 Community Health Grant program. HPES was one of only seven nonprofit organizations to receive this recognition as the best organization for diabetes screening, prevention, and education, nationwide. Congratulations! UUMC members Dr. Bob and Jane Paine founded and our congregation continues to support Health Protection and Education Services (HPES). HPES provides free health screenings one Saturday morning each month at the U-City Library in the Delmar Loop. Additional free services include education and treatment referrals, mammograms, sickle cell testing, and free STD, HIV and AIDS testing. HPES consists of volunteer medical professionals, including doctors, dentists, nurses, medical technicians and health educators and medical students. Non-medical volunteers greet, keep records, and help as needed. The Itaqua Group is 16 persons who live and work in Sao Paolo, Brazil. They are borrowing $1,950. Laurentino is the leader of the group. He has owned a grocer store for 10 years and will use his portion of the loan to purchase rice, beans, fruits, vegetables, cold cuts and cleaning items to sell in his store. We loaned $100. The Abadasigana Acb Group is 15 persons who live in Ruanda. They are borrowing $5,300. Alphred is the leader of the group and has run his timber business for the past 21 years. He will use his portion of the loan to purchase more timber to sell at the local market. We loaned $75. Khaled is a Syrian refugee who moved to Lebanon in 2011. He is a house painter and is borrowing $1,200 with which to buy scaffolding and wood to better serve his customers. We loaned $100. Tulizana Group is a large group of persons (19) who live in Goma, North Kivu province, Congo (DRC), one of the most war-torn areas of the country. The group is borrowing $3,150. Angela operates a kiosk in a popular area of the city where she sells a variety of things. She will use her portion of the loan to purchase a box of soap, 10 kg of sugar, biscuits, milk, slippers, oil and other products to sell in her kiosk. We loaned $100. Dalal is in the middle and is standing in the doorway of her tent. We loaned $100. 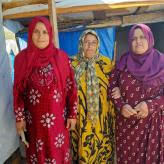 Majmouat Al Kheir Group is three Syrian refugee women who live in Marjeyoun, Lebanon. The group is borrowing $1,800. Dalal has been a hair dresser and makeup artist since she fled to Lebanon in 2012 with her husband and eight children. They currently live in a tent and experience hard living conditions. She will use her portion of the loan to make necessary repairs to the tent. Francois lives in Cameroon and, for the past 20 years, has been operating a corn processing shop. He has a good business but his customers needs are growing and he is the only business like his in the city. He is borrowing $875 to purchase a new crusher to keep up with customer demand. We loaned $50. Mrs Da is an ethnic minority living in a mountainous region of Thanh Hoa Province, Viet Nam.The region is very poor and suffers often from disasters such as flooding and drought. Da raises cattle and is borrowing $650 to buy calves to raise and sell. We loaned $100. Guadalupe has been a fisherwoman for three years. She lives with her family in Baybay City, Leyte, Phillippines. She is borrowing PHP 10,000 ($200) to purchase fishing nets, gasoline and other fishing supplies. We loaned $100. Katherine Gabriella owns and operates an opthalmology clinic with her sister in Gotera, El Salvador, about a one hour bus ride from her home. 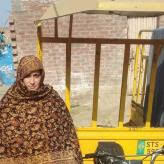 She is borrowing $200 to purchase a desk in order to better serve her clients. We loaned $100. The Port-Fortaleza Group is nine women and one man who live in Portovieteo, Ecuador. The group is borrowing $5,475. Monseratte de Jesus is a tailor who lives with her husband (a master painter) and four children. 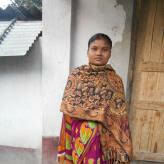 She makes all kinds of garments but prefers garments for women and children. We loaned $100. Thank you for your support and your continued interest.